I'd love to be one of those cooks who never has to consult a recipe. But when I do need to follow a text, I want to do so in a way that is convenient, legible, accessable yet out of the way of mixing bowls, chopping boards and the like. Here's my solution (pictured above). I use a litttle page holding device called the Page-Up paper holder, found in many office supply or stationery stores. (A close-up image appears at the end of this post). The page is held aloft on the counter top, and is barely as wide and deep as the page itself, thus freeing up valuable counter space. While this will work with most normal-weight paper, I keep my recipe pages in clear plastic sleeves, to protect them from wear and the inevitable splatters of batter, grease and smudgy fingers. The plastic sleeve adds enough structure to aid in holding the page firmly in place. When I am done with the recipe, I simply return it to my recipe binder (which will be the focus of another post soon). In the past, I have tried the acrylic shields that will hold an entire recipe book. In practice, I found them unweildy, not fully protective of the book, too small for some of them, and a real hassle in the case of recipes that required the turning of a page in the cook book. Other than that, they are fine. (rim shot). Oh, and they take up WAY to much counter space. 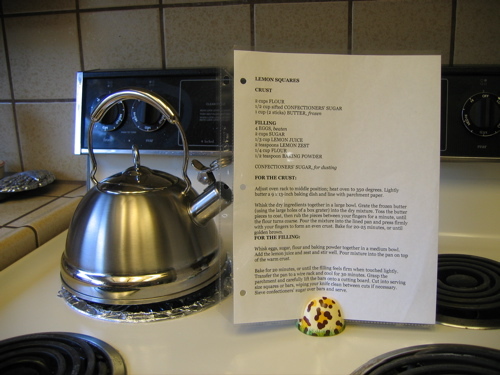 I try to keep my recipes to one page, but should it continue to the other side of the page, it is easy to turn around the clear plastic sheets and view the other side. So there you have it. This system works well for me. Got an idea or trick to share for holding your recipes? Leave me a comment! Better yet, take a picture and blog on it, and I'll post a round up of ideas here on this blog for all to enjoy. Who knows, maybe you'll convert me to your method. 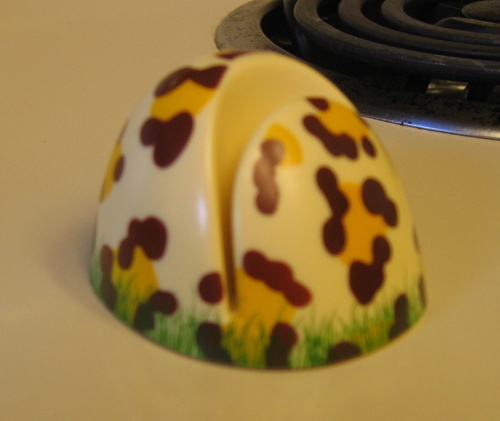 My little holder is s sporty leopard print style, but you can find them in solid colors and other designs to match your decor here. A recipe for brown sugar? Yes. Read on. You know how professional chefs assemble all their cooking ingredients, or "mise en place", BEFORE they begin cooking? There is a good reason for that. Several good reasons. And there is a reason this food blog is called Rookie Cookery, not "professional chef who thinks ahead and prepares properly" Cookery. So there I was, mixing up Alton Brown's carrot cake recipe, (which I'll feature in the next post), when I realized....."Hey--I don't have enough carrots!" So I ran to the store, bought more carrots, ran home, and resumed mixing the cake. Then I got to the part where I needed brown sugar. No brown sugar. Curses! 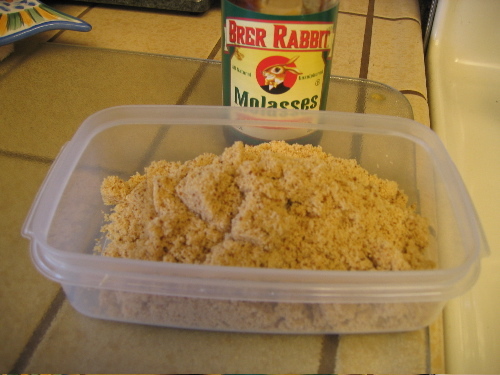 I was about to run to the store again, when I suddenly remembered...."Hey, didn't Alton Brown say on his show that you can make brown sugar simply by adding molasses to regular white sugar?" Since I was using his book "I'm Just Here For More Food; Food x Mixing + Heat=Baking" for the carrot cake recipe, I looked it up....and sure enough, there it was. So I poured a cup of sugar in a food processsor bowl, dribbled on a few spoonfuls of molasses....pulsed the mixer a few times until it looked and tasted like brown sugar....and it worked like a charm! Directions: Mix well to taste. There were no amounts mentioned in Alton's book, but even this Rookie was able to figure it out. Thus the cake and the day were saved. Next: Alton's heavenly carrot cake recipe! Adam over at Amateur Gourmet had a culinary epiphany recently when he finally used an oven thermometer and discovered that actual oven temperatures can vary a great deal from the setting on the temperature dial. Sad, but true. Electric ovens actually cycle on and off continually, creating more of a range of temperatures (hopefully) in the target zone you have set. 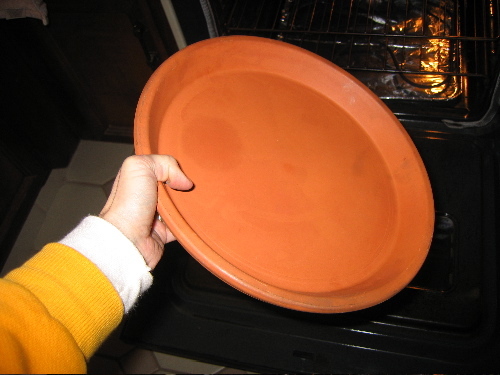 This plate can also be used as a fantastic base upon which to bake bread, or even a small pizza, for that brick oven taste and texture that is so wonderful. 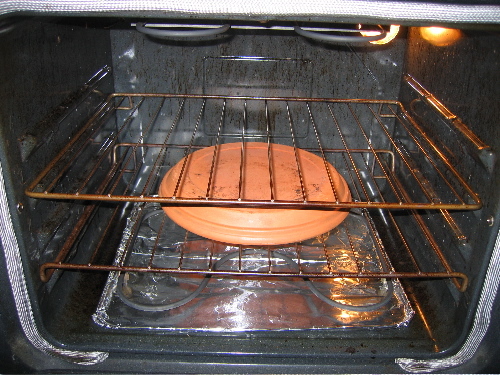 Just remember to always heat the terra cotta plate along with the oven, and let it cool slowly as well, to avoid breakage from sudden heat changes. If you are going to remove it and use the bottom rack (such as when baking a turkey), you'll have to remember to remove it before heating it or else you will have to find a safe place to let it cool outside. If you are a true baking fanatic and crave a brick style oven in your own home, look no further than the Hearth Kit. The Hearth Kit is an easy to assemble oven insert that turns the home oven into a brick oven. Brilliant! 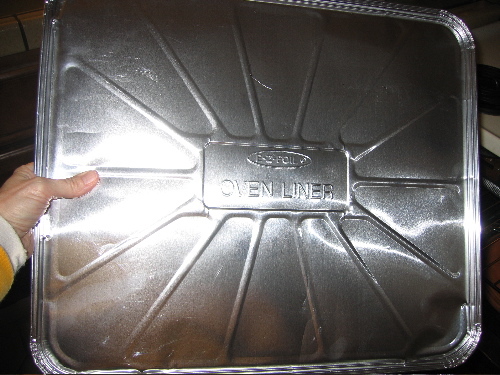 They are aluminum oven liners. The first time I saw these, I thought "why should I pay for those when I can just use a couple sheets of aluminum foil?" Then the light bulb appeared over my head. I bought the liners (three to a pack, I think) and when I got home I covered the liner in aluminum foil! Now when it gets dirty, I simply throw away the foil and re-cover the pre-formed liner. This is nice because it has a sturdy construction and a nice lip around the perimeter. There are burner-pan liners available too but I may go back to just wrapping my burner pans in foil, which seems to work better. That's it! That's your first Rookie Cookery tip for 2006!